GAVIN O’REILLY has stepped down as the chief executive of Independent News and Media (INM). The move came during a board meeting this afternoon. Earlier today, it emerged that an anonymous buyer purchased 13 million shares in INM (that is two per cent of the organisation). A source had indicated to TheJournal.ie that Vincent Crowley, current Group Chief Operating Officer at INM, is to take over. That suggestion was confirmed by a statement from INM this evening. Crowley will be both CEO and an executive Director with immediate effect. The statement says that O’Reilly’s resignation “follows a compromise agreement approved unanimously by the Board of Directors”. O’Reilly has also resigned today as non-executive Chairman and Director of APN News & Media Limited (APN) in which INM holds a 29.5 equity stake. After 19 eventful years with the Company, it is time for me to pursue new opportunities. It had become clear that recent and public shareholder tensions were proving an unnecessary distraction for both me and the Company and this was not in the best interests of the Company. The Board and I agreed that what the Company needs now is a board, management team and shareholder base that is purposefully unified and aligned for the Company’s immediate challenges and for the many opportunities that exist in the future. I leave this great Company with mixed emotions, and I want to particularly thank my work colleagues and friends across Australasia, Ireland, South Africa and the UK, who I have had the great honour and privilege to work alongside. I believe he is well equipped to position the Group for the challenges which continue to face the media industry. The annual meeting for Independent News and Media is due to take place on 8 June. The O’Reilly family have headed up INM for almost four decades. Tony O’Reilly Snr, Gavin’s father, stepped aside in 2009 from both the role of CEO and from the board of INM and was succeeded by Gavin. That move in 2009 had been supported by Denis O’Brien but in recent months, it had been suggested that O’Brien was looking to remove the younger O’Reilly from the post in a battle over control of the direction of the company. O’Brien owns over 22 per cent of INM shares. 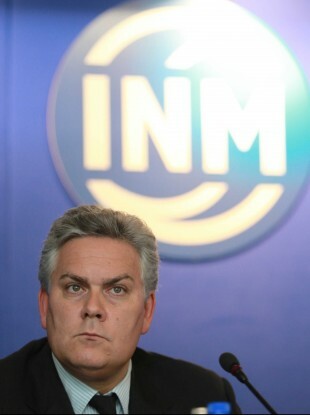 Independent News and Media Plc reported a pre-tax loss of €63.6m for 2011 earlier this year. Email “Gavin O'Reilly steps down as CEO of INM”. Feedback on “Gavin O'Reilly steps down as CEO of INM”.